Everyone is excited for Glen Check, for good reasons. With its mind-meltingly complex blend of modern rock and electronica, Glen Check already has a dedicated following that calls Glen Check's music a religion, hailing "Glellujah." With their appearance in SXSW Seoulsonic stage, Glen Check is poised to reach even greater heights. The Korean met with Glen Check outside of the Icenhauer Stage during the Seoulsonic showcase. The interview was conducted in Korean; the translation is the Korean's own. TK: Please say hello to everyone. TK: When and how did Glen Check form? 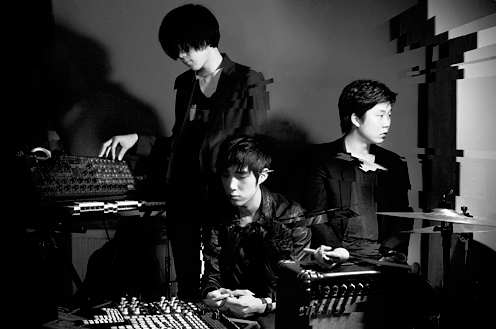 Hyeokjun: Glen Check was formed in 2010. We all attended the same high school. TK: How would you describe Glen Check's music? Junwon: We don't belong to a particular genre; we employ a different style for each album. We just want to keep trying something new. We are based on electronica, but we try to have variety. TK: How are you enjoying SXSW? Junwon: Probably because everyone is drunk. [Laughter] There is great energy here. Rock festivals in Korea are usually in front of one huge crowd. The setting here is more intimate. And it looks like we have more fans than we thought. It has been an interesting experience. TK: What do you consider your musical influence? Junwon: We go with different inspiration for different albums. The most recent one was about the music of the late 1980s and early 90s. Our first album was about 70s and 80s. Hyeokjun: I would say Michael Jackson and Prince. Pink Floyd too. Junwon: New Order, Joy Division. TK: Any parting words for AAK! readers? Hyeokjun: We had a great time at SXSW! Look out for us in the future, because we want to reach even more people with our music.